The PIX has three fans: a 92mm case fan, a 92mm fan in the power supply, and a 50mm fan in the CPU heat sink. 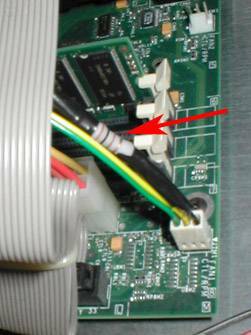 The two 92mm fas are replaced and a resistor is used to reduce the voltage on the CPU fan. This 92mm 12V Mechatronics E9225E12B (0.498A) fan that sounds like a jet engine (56 CFM, 39 dBA) is replaced with a Zalman ZM-F2 38 CFM 20dBA fan. This 92mm 12V Panaflo 48 CFM 30dBA fan is replaced with another Zalman ZM-F2 38 CFM 20dBA fan. 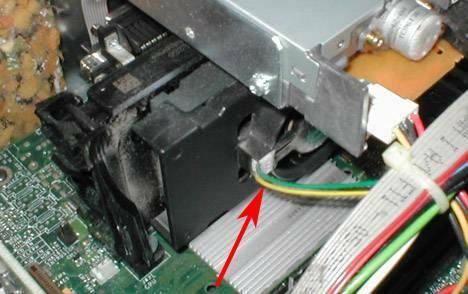 The CPU heat sink has an integrated fan in it. It makes it hard to replace and also you cannot get any information from the fan like model, CFM, dBA or amperage it draws. It sounds like its about 30 to 35 dBA. Instead of building the the adjustable volage regulator as in the 3640 project,or buying a commercial one, we'll use a resistor to reduce the volatage and therby the fan speed and noise. We need to find out the running resistance of the fan. I used a multimeter to find the current amperage draw, which is 41mA. 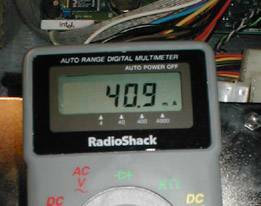 12V=0.041A*(R) so the internal resistance is 293 Ohms. R = (293(12-9))/9 = 98 Ohms. Since I don't have a 98 Ohm resistor, I will just recalculate what I have using a 100 Ohm resistor. 12 V/393 Ohms = 31mA. This was also confirmed by the meter after completion. 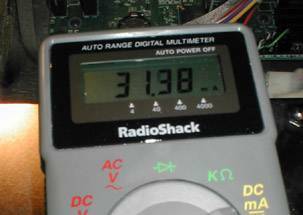 So the voltage drop across the fan is 0.031*293 = 9V which is just fine. I used a 100 Ohm 1 watt resistor (cat. no. 271-152). I glued carpet under matting remnants on much of the internal metal surfaces to absorb the sound instead on just reflecting it out of the box.